Lock in a great price for Millennium Hotel Doha – rated 8.7 by recent guests! It was nicer and cleaner than the Doha Hilton and the Rotana Citi center. The location as close to the new Marqueb Mall and we enjoyed visiting the Swimming pool and hearing the piano player in the beautiful Lobby. I also liked the Master control panel right next to the bed for lights and room temperature control! Size of room. Staff friendly n helpful . Restaurant staff friendly and accommodating. Breakfast brought to our room very early morning because of our early flight . Grateful for this. Very enjoyable steam room, sauna and jacuzzi, along with an adequate fitness room. Staff was friendly, accommodating and exceptionally helpful. 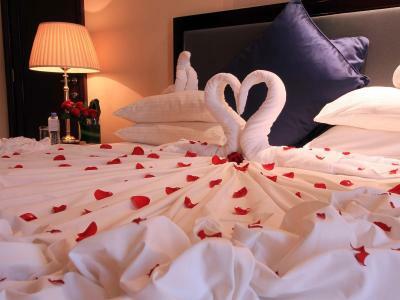 Room was tasteful business decor, comfortable bed and nice bath. Room was quiet and peaceful. Stayed for 19 days. It was nice. It is perfect for long stays. The most impressive thing is that whenever you need something they will provide it within 5 minutes. I am a regular guest. Twice or sometimes thrice every month. So, that should speak! 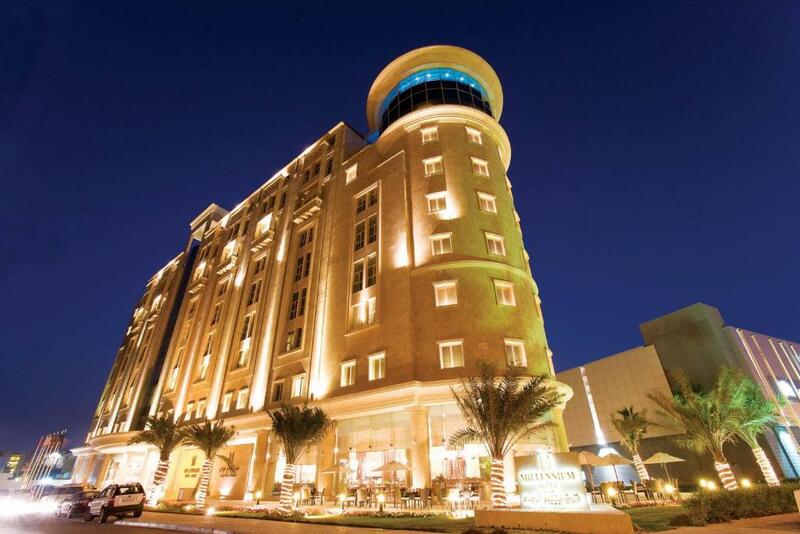 Millennium Hotel Doha This rating is a reflection of how the property compares to the industry standard when it comes to price, facilities and services available. It's based on a self-evaluation by the property. Use this rating to help choose your stay! One of our top picks in Doha.With primary location in Doha, Millennium Hotel is only 6.2 mi from the Hamad International Airport. It features a spa complete with an indoor pool, hot tub, sauna and steam bath. Villaggio Mall and Aspire Zone are a 12-minute drive from the property. Guests can enjoy watching the FIFA Worldcup 2018 live at the hotel lobby lounge. 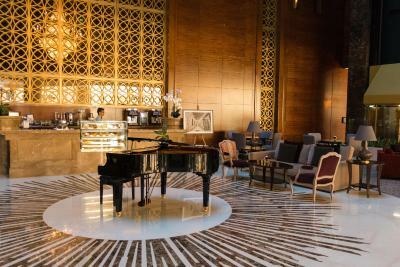 The Atrium Café offers a pleasant setting for a drink while listening to soft harp and piano music. Apart from pastries and cocktails, it organizes themed Italian, Mexican and hamburger nights. 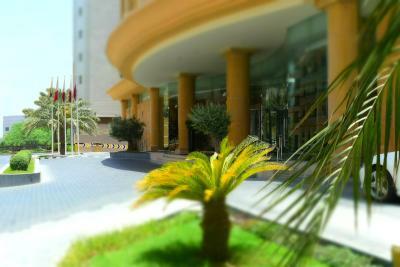 Millennium Hotel Doha has access to C & D ring roads, as well as Salwa Road. Hamad Hospital is a 5-minute walk from the property. The famous Doha Corniche can be reached in 7 minutes by feet. Katara Art Center is 8.7 mi away. Hamad International Airport is 25 minutes from the property. When would you like to stay at Millennium Hotel Doha? Our Standard King Room offers a space of 32sqm complete with a king size bed, arranged with crisp linens. Equipped with workspace, complimentary high-speed wireless internet, and mini fridge, with view of the city. Amenities: Access to Pure Spa from 7AM to 11PM, LCD TV, in-room safe, complimentary coffee/ tea making facilities, and bottled water, iron and iron board, airport transfers at minimal fee. Our Deluxe King Room offers spacious 37sqm equipped with king size bed and crisp linens, a workspace, complimentary high-speed wireless internet, in-room coffee and tea making facilities and mini fridge, with city view. Amenities: Access to 24-hour fitness center, LCD TV, in-room safe, complimentary coffee/ tea and bottled water, iron and iron board, airport transfers at minimal fee. Spacious 42sqm Club King Rooms offer chic comfort with classy furniture, king size bed, working and relaxation areas, complimentary high-speed wired and wireless internet, in-room coffee and tea making facilities, mini fridge, restaurant buffet breakfast, and city view. Amenities: Games, TV, personalized service and added privileges, access to 24-hour gym, LCD TV, in-room safe, complimentary coffee/ tea and bottled water, iron and iron board, one-way airport transfer. Our spacious 53sqm Junior Suite will be a refreshing sanctuary during your stay in Doha. 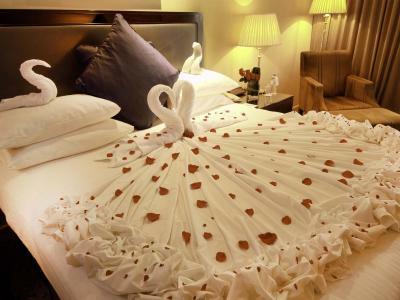 Offers a bedroom with king size bed and crisp white cotton linens, LCD flat screen TV with high definition channels. Equipped with sofa sleeper and working space. Features parquet flooring and inter-connecting room option. Amenities: Games, TV, snacks, restaurant buffet breakfast or lounge a la carte, personalized service and added privileges, complimentary hi-speed internet access, 24-hour gym, LCD TV, in-room safe, mini fridge, complimentary coffee/ tea making facilities, and bottled water, iron and iron board, airport transfers at minimal fee. Our Executive Suite is the perfect spot to simply enjoy the unique floor plan for your overnight stay in Doha. This 75sqm suite features a king size bed, seating area, dining table, and mini fridge. The large bathroom features a walk-in shower, featured bath amenities, inter-connecting room option. Amenities: Games, TV, snacks, restaurant buffet breakfast or lounge a la carte, personalized service and added privileges, complimentary hi-speed internet access, 24-hour fitness center, LCD TV, in-room safe, mini fridge, complimentary coffee/ tea making facilities, and bottled water, airport transfers at minimal fee. Our spacious 95sqm Diplomatic Suites include one-bedroom with living area located on high floors, a king size bed, a reading nook, guest toilet, and a luxurious private bathroom and inter-connecting room option. Amenities: Games, TV, snacks, restaurant buffet breakfast or lounge a la carte, personalized service and added privileges, writing desk area, Complimentary hi-speed internet access, 24-hour fitness center, LCD TV, in-room safe, mini fridge, complimentary coffee/ tea making facilities, and bottled water, iron and iron board, airport transfers at minimal fee. Our oversize 120sqm Presidential Suite, on high floors are spacious enough for families and suitable for sophisticated business entertaining. Include a second bedroom option, vibrant views and separate living and sleeping areas, dining area seats 6 as does the living area, a pantry and a bar, bench, closet, and a separate powder room, private bathroom includes a deep soaking tub, a separate shower, and two lavatories. Connecting room options for a second bedroom has another full bathroom. Amenities: Games, TV, snacks, restaurant buffet breakfast or lounge a la carte, personalized service and added privileges, writing desk area, Complimentary hi-speed internet access, 24-hour fitness center, LCD TV, in-room safe, mini fridge, complimentary coffee/ tea making facilities, and bottled water, iron and iron board, airport transfers and butler service at minimal fee. Our Family Rooms feature two inter-connecting rooms, king-sized and twin beds, and work space. Amenities: Complimentary hi-speed internet access, 24-hour fitness center, LCD TV, in-room safe, mini fridge, complimentary coffee/ tea making facilities, and bottled water, iron and iron board, airport transfers at minimal fee. Our Standard Twin Room offers a space of 32sqm complete with two single beds, arranged with crisp linens. Equipped with workspace, complimentary high-speed wireless internet, mini fridge, with view of the city. Amenities: LCD TV, in-room safe, complimentary coffee/ tea making facilities and bottled water, iron and iron board, airport transfers at minimal fee. Our Deluxe Twin Room offers spacious 37sqm equipped with two single beds and crisp linens, a workspace, complimentary high-speed and wireless internet, in-room coffee and tea making facilities and mini fridge, with city view. Amenities: Access to 24-hour fitness center, LCD TV, in-room safe, complimentary coffee/ tea and bottled water, iron and iron board, airport transfers at minimal fee. Spacious 42sqm Club Twin Rooms offer chic comfort with classy furniture, two single beds, working and relaxation areas, bathroom with large walk-in shower and tub, featured bath amenities, complimentary high-speed wired and wireless internet, in-room coffee and tea making facilities and mini fridge, restaurant buffet breakfast or lounge a la carte, and city view. Amenities: Games, TV, snacks, personalized service and added privileges, access to 24-hour gym, LCD TV, in-room safe, complimentary coffee/ tea and bottled water, iron and iron board, one-way airport transfer. 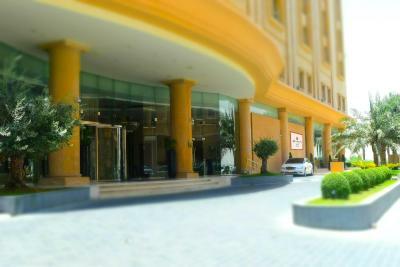 Millennium Hotel Doha offers the famous warmth of Arabian hospitality through an exclusive array of services and leisure facilities. 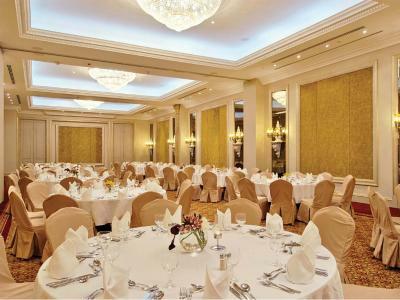 As a guest in this Doha hotel, you will indulge yourself with a superb range of dining and relaxation facilities. 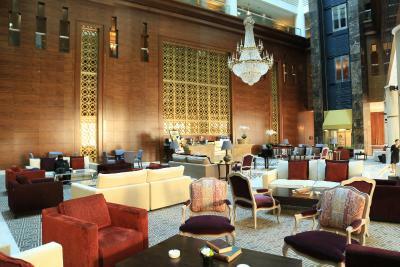 House Rules Millennium Hotel Doha takes special requests – add in the next step! Millennium Hotel Doha accepts these cards and reserves the right to temporarily hold an amount prior to arrival. Please inform Millennium Hotel Doha of your expected arrival time in advance. You can use the Special Requests box when booking, or contact the property directly using the contact details in your confirmation. Thanks Mr. Khalil... appreciate it. Valet parking guys jumps to your car asking you to pull over quickly. It is quite and very reliable hotel. . I could hear the music played in the lobby bar and the noise of the ventilation system outside the window. I wish the refrigerator I the room had a small freezer section because we bought some ice cream treats but they melted because there was no freezer section in the in-room refrigerator. We thought there should be a direct entrance, like a pedestrian bridge from the hotel to the Mall next door, across the street, or at least a more pedestrian friendly walkway to the Mall next door. On Second day , there were no face towels given. Until I called up to remind, then on third day they were included in linen but not when called up second day.